Introduction; History and economics of conveyor applications; Design of belt conveyors 1 – Power requirements and belt tensions; Design of belt conveyors 2 – Hardware (Idlers, structure, pulleys, drives, tensioning devices, transfer points and belt cleaning); Belt constructions; Joining conveyor belts; Standards, test methods and their standardisation; Safety considerations – Fire and electrical resistance properties of the belt conveyor; Safety considerations 2– Nip points, stored tension, man-riding and materials transportation on belts; Maintenance and monitoring; Case histories. 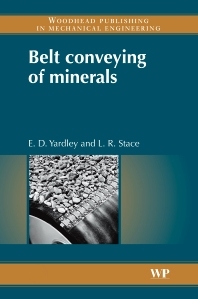 Belt Conveying of Minerals is a comprehensive reference on the science and technology of belt conveyors, aimed at providing mine and quarry operators, as well as engineering students, with a balanced view of the technical issues associated with belt conveyors and to assist in the decision-making process when installing belt conveyor systems. A discussion of the history and economics of conveyor applications sets the scene. Conveyor design is investigated in detail, covering power requirements, belt tensioning, and hardware. Principles regarding construction and joining of belts are outlined and a helpful and practical overview of relevant standards, belt test methods, and issues surrounding standardisation is given. Conveyor belt systems can represent a significant operational hazard, so the authors have set out to highlight the important area of safety, with consideration given to fire/electrical resistance, as well as the interface between personnel and conveyor systems – including nip points and operational issues such as man-riding. Selected case studies illustrate some practical aspects of installation and operation. Dr E. D. Yardley C Eng, PhD, MIMMM, MIMechE is a retired Consultant Engineer, who has more than 30 years' experience of development, testing and practical application of equipment in the coal mining industry. Dr L. R. Stace Ceng, PhD, FIMM is Associate Professor, School of Civil Engineering, University of Nottingham and has some 20 years past experience in the coal mining industry.